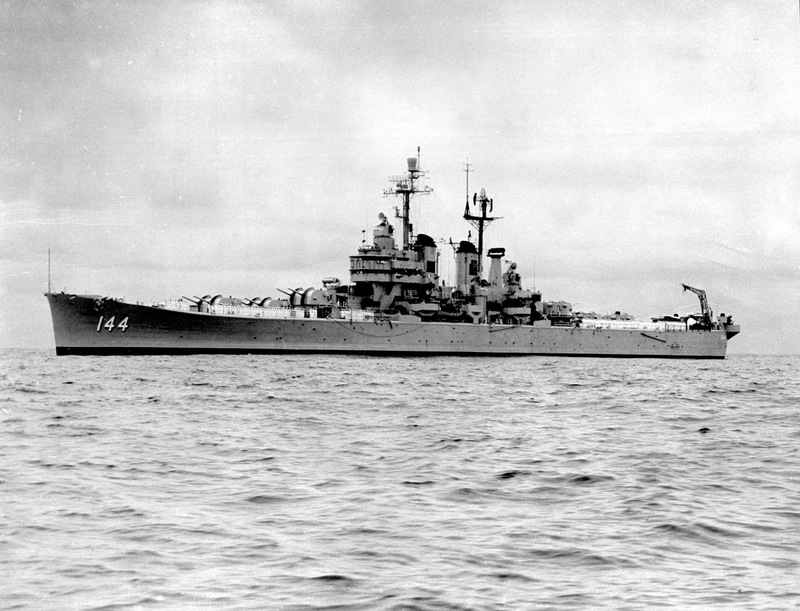 California, at the time of Fleet Admiral Chester W. Nimitz' review of the First Fleet, 13 June 1957. USS Worcester underway in 1949. 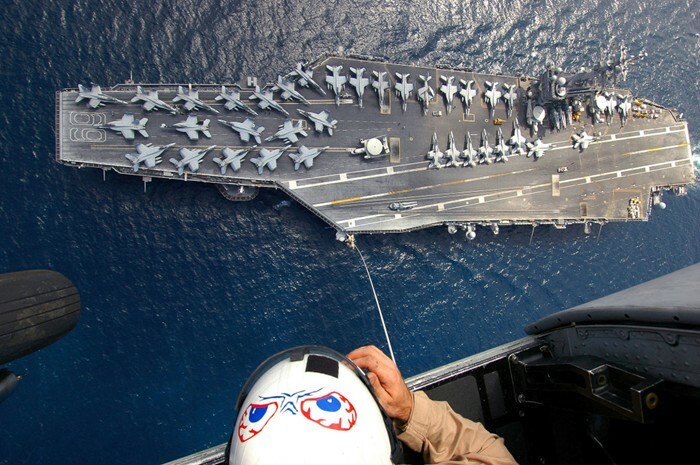 Note the high angle of the guns! 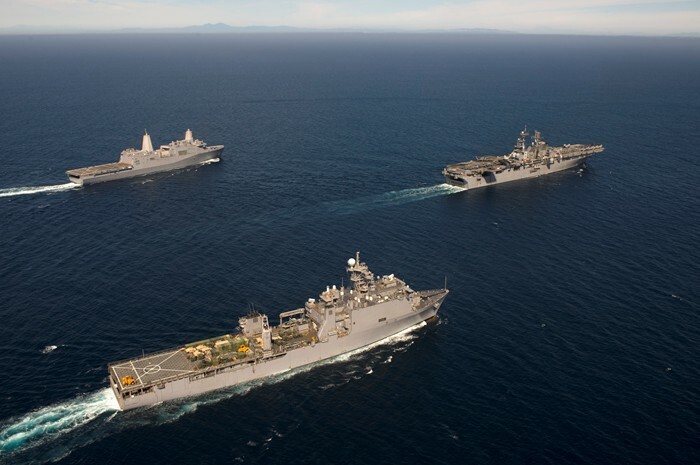 Ten ships were planned to enter service with the U.S. Navy but after the end of the war in 1945, there was no need anymore for additional large surface combatants, thus just three were laid down in 1945 but ultimately only two completed in 1948-49, one ship per year. 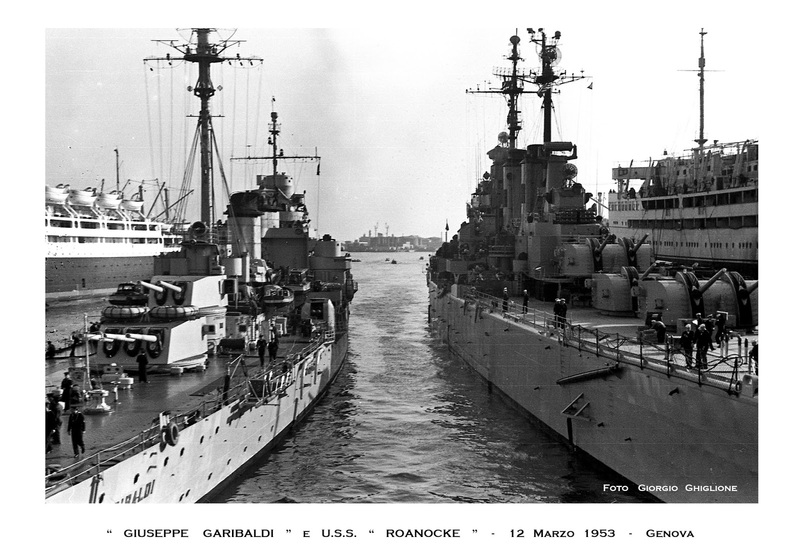 They were the USS Worcester (CL-144) and USS Roanoke (CL-145). 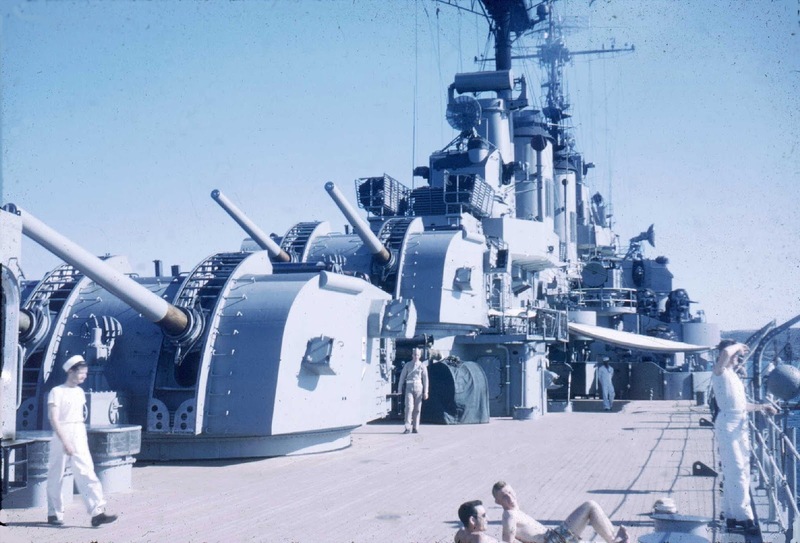 Aside from the main guns' caliber, the main battery layout was identical to the much smaller Juneau class anti-aircraft cruisers (an evolution of the Atlanta class light cruisers). The Worcesters mounted twin gun turrets unlike the previous classes of light cruisers; six twin turrets, three forward and three aft, all on the centreline with only turrets 3 and 4 superfiring while the turrets 2 and 5 have very restricted arcs of fire. The main reason for the extremely long hull was exactly the need to accommodate the large magazines needed to supply such a large number of rapid-firing guns. 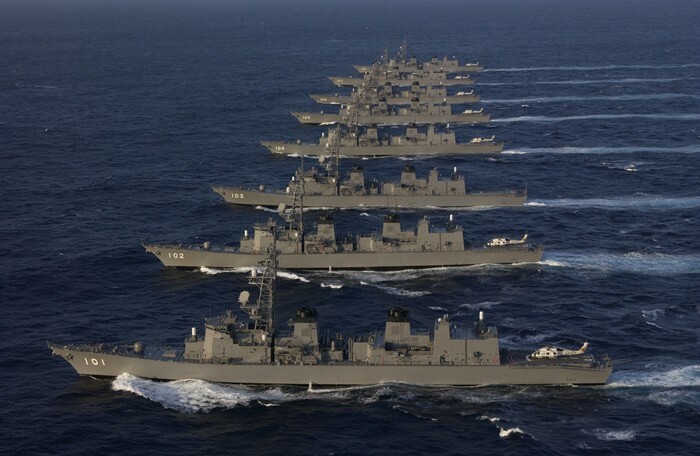 The ships were built around the weapons and not the opposite. 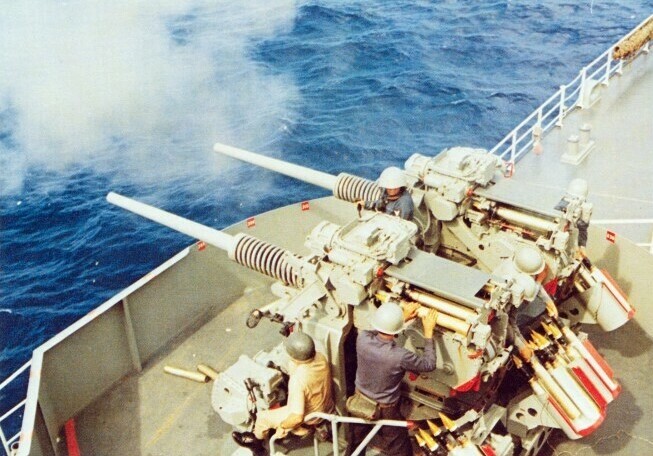 6-in (152-mm) L/47 DP Mk 16 guns. 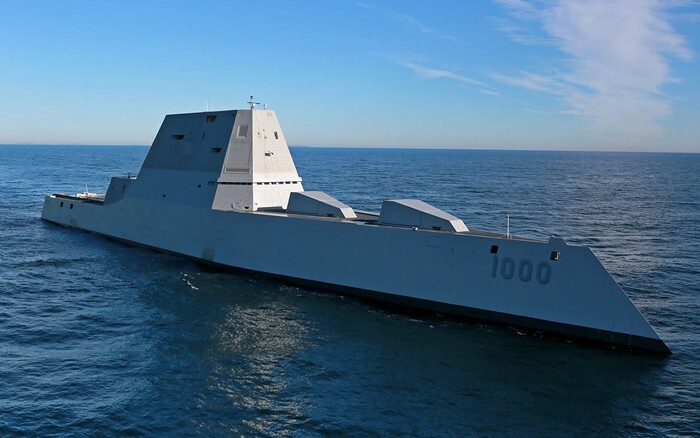 Note the Mk-27 Fire Control Radars. The ships were designed based on the tactical requirement for a large fast warship to protect the fleet in almost any weather, with fuel capacity for long voyages and most important with weapons capable of engaging heavy high-altitude bombers, the first generation of anti-ship missiles introduced by Germany in 1943 and repelling massed air attacks at extended ranges, as well as dealing with multiple surface targets, but also with heavy deck armor to survive high-altitude bombing. 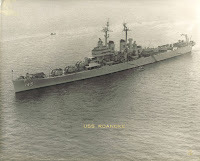 Therefore, the two ships were equipped with the first truly dual-purpose gun larger than 5 inch, the first 6-inch gun capable of engaging aircraft in longer distances (23,880 meters maximum range), the recently perfected high-angle automatic 6-in (152-mm) L/47 DP Mk 16, which had fast training and elevation rates and high rate of fire. 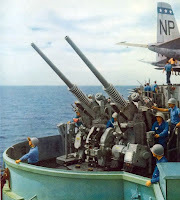 Also, unlike all previous US 6-inch guns, these could load at any angle, greatly enhancing their use in the anti-aircraft role. Manning was twenty-one crewmembers in the gunhouse, ten in the turret officer's booth and eleven in the gun house. This was made up of eleven turret controlmen, three gun-laying operators, three gun operators, two hot-case men, and two projectile loaders. 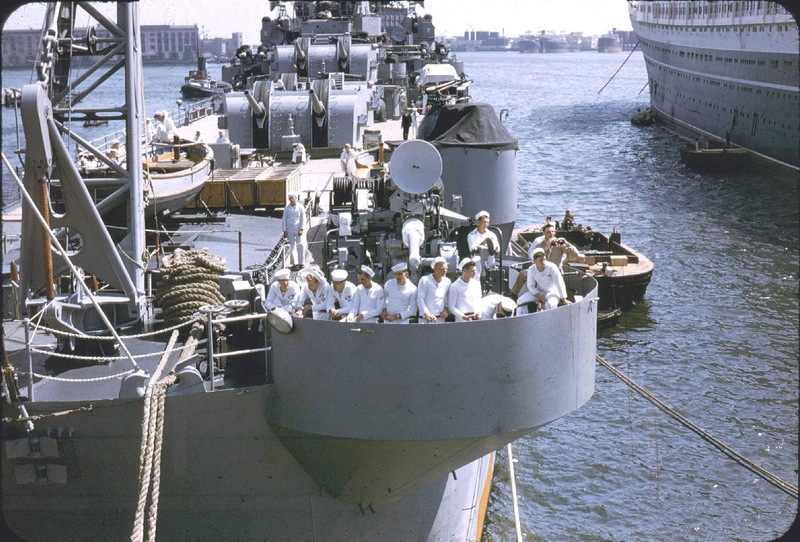 The new gun turret was tested first on the gunnery training ship USS Mississippi AG-128 (former BB-41). 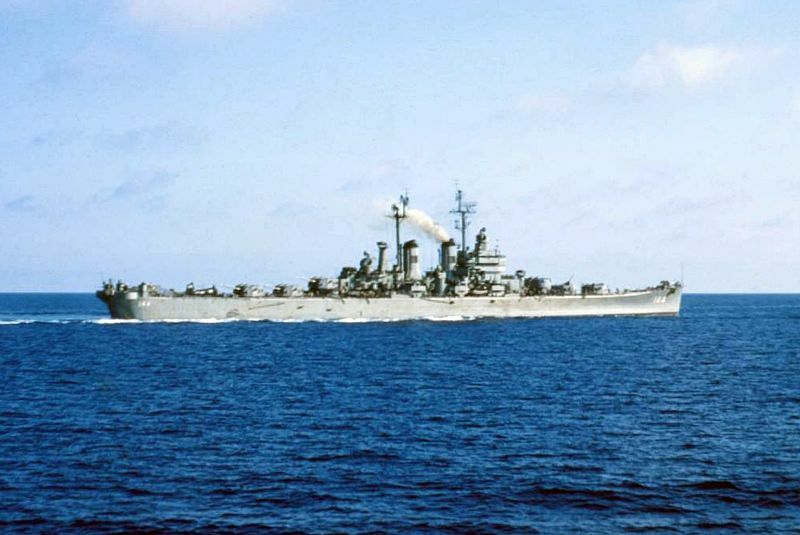 The cruisers, except the 6-inch guns, were equipped with a total of 24 (!) 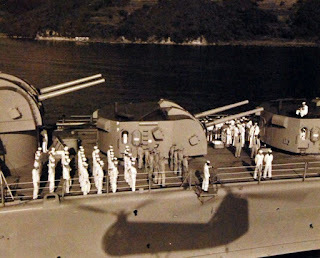 3-inch (76.2-mm) dual purpose guns on open mounts; five Mk33 twin mounts on the port side, five on the starboard and one in the bow which was later removed. A pair of single Mk34 mounts on blisters were on each side of the fantail. 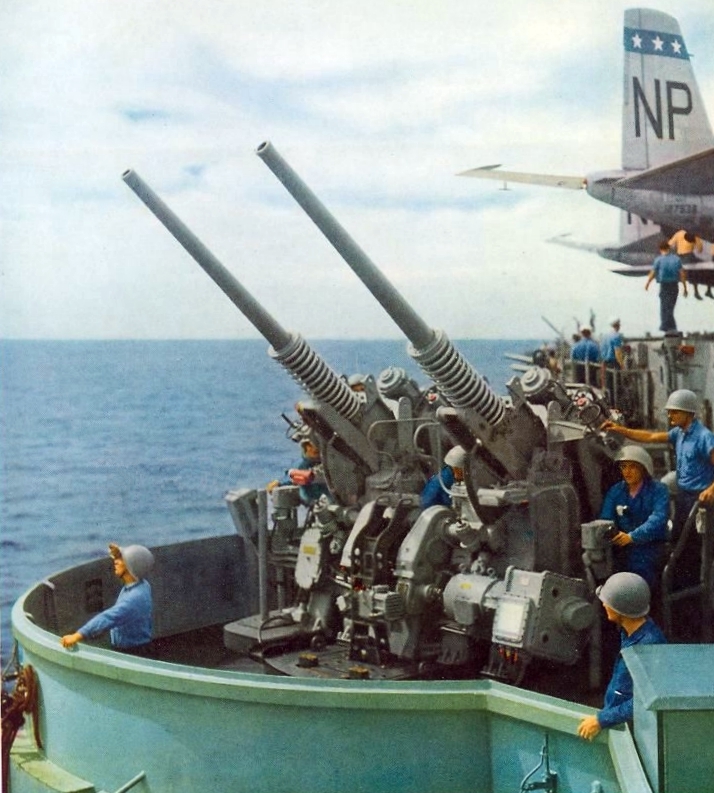 The new 3-inch guns, were designed according to the emerged need for a lighter automatic weapon than the 5-inch guns to stop the Japanese Kamikaze attacks as the 20mm and 40mm guns were proved ineffective for this role. The tests testing showed that against a target representing a Nakajima plane a single rapid-fire 3"/50 (7.62 cm) was as effective as two 40 mm quad mountings and that it could effectively engage at a much longer range (max. range was 13,300 meters and rate of fire 50rds/min). When shooting at aircraft, the gun has to fire at the place in the sky where the aircraft will be when it meets up with the round which has just been fired, based on the radar calculations. The 3in/50 magazine had a capacity of 1,518 rounds. Normal crew for the twin 3in/50 (7.62 cm) was eleven men, including a mount captain, two control station men, four shellmen and four shell passers. 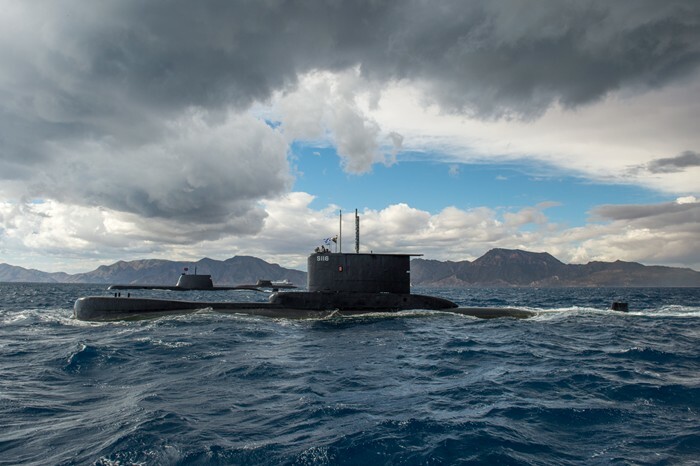 However, it was not until 1948 that this weapon was delivered to the fleet in quantity. Modified photo of a Worcester class anti-aircraft cruiser. For a high resolution image click here. 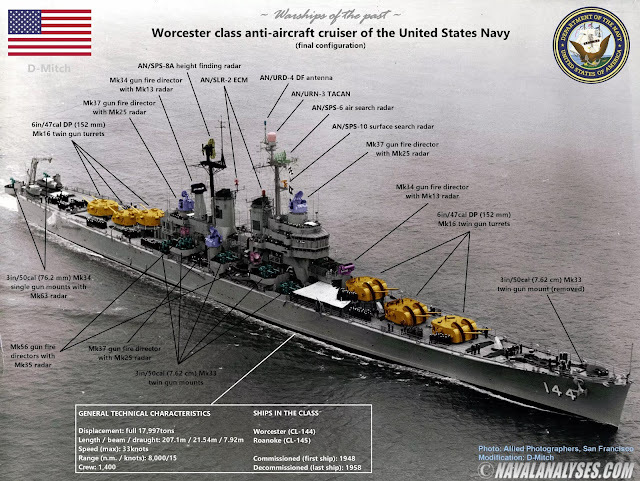 The Worcester class cruisers, had numerous fire control radars, setting a new standard for a light cruiser. The gun directors were two Mk34 with Mk13 antenna mounts, four Mk37 with Mk 25 radar mounts, four Mk56 with Mk35 antenna mounts, six Mk 27 radar equipment mounted in each of the 6 main turrets and two Mk63 individual radars for the 3in gun single mounts on the stern. 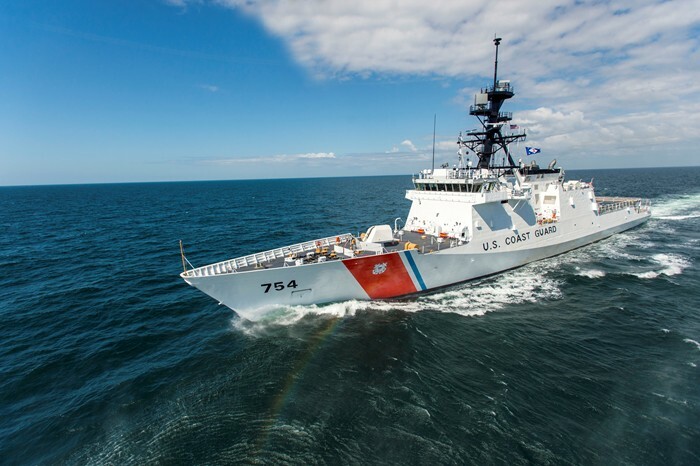 At her commissioning, USS Worcester carried the SR-2 and SG-6 surface search radars on the main mast, the SR-6/SP-6 air search radar on a mast just forward of the rear stack, and the SP-1 height finding direction (air-search) radar on the after mast. The SR-2 proved to be not effective, and was later replaced by the SR-6 from the mast ahead of the after stack, which was in turn removed. The SP-1 radar was replaced later with the newer and more effective SP-8 while the SG-6 was later removed and on the main mast were installed an SP-10 surface search radar and TACAN. 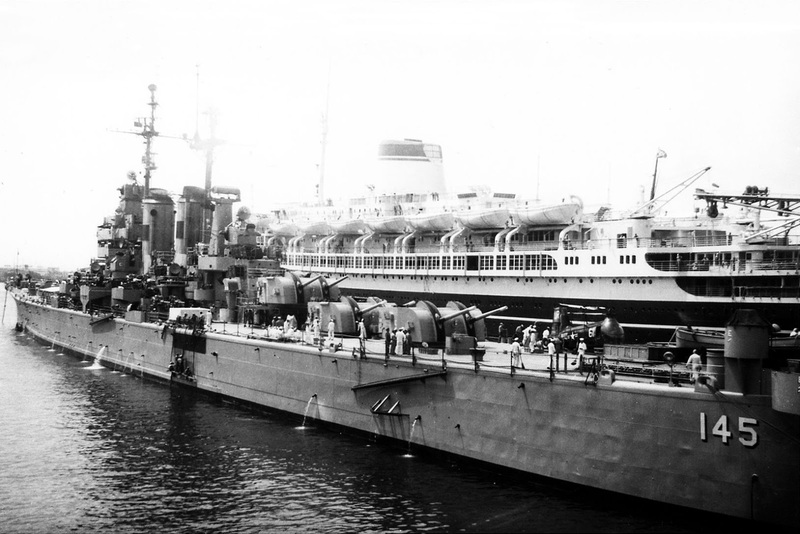 The ships received also the AN/SLR-2 ECM system that consisted of various antennas. on 25 July 1956 when it collided with the MS Stockholm. 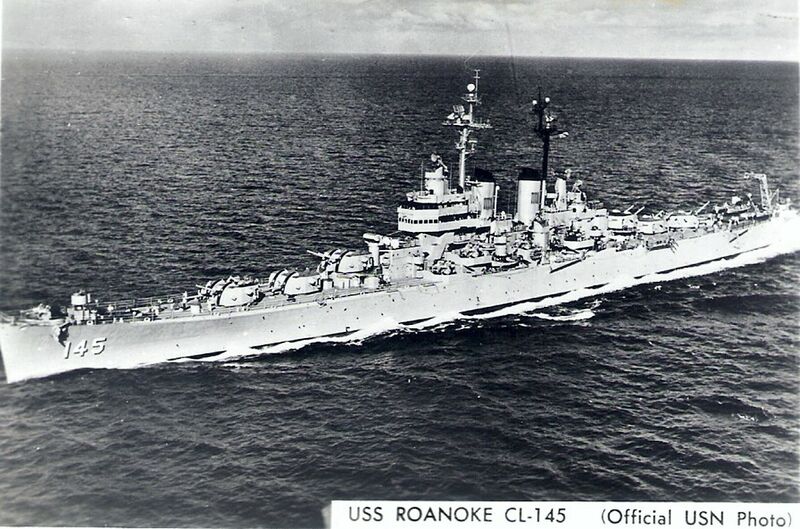 The USS Roanoke served primarily in the Atlantic and Mediterranean, with her last three years in the Pacific. 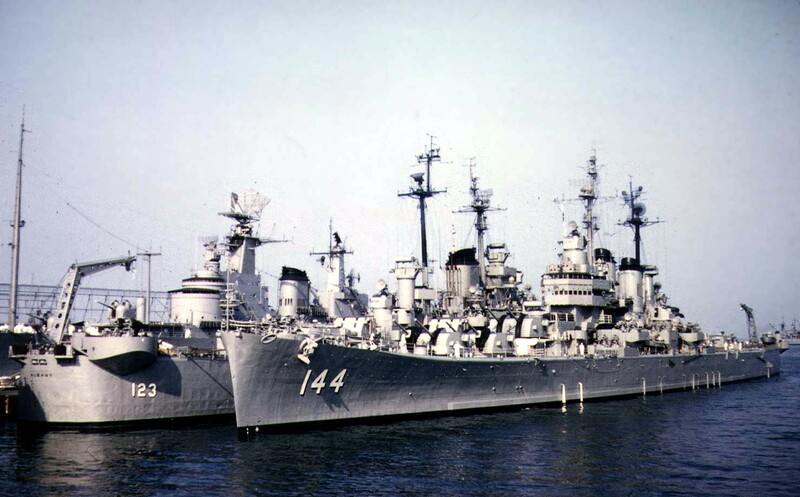 USS Worcester had a slightly more colorful life, earning two battle stars for her Korean War service. 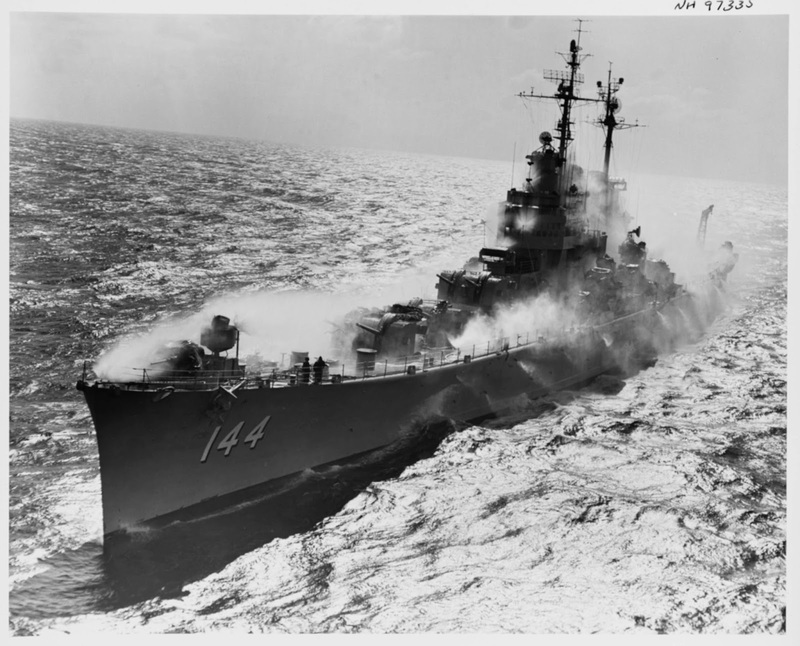 The following video shows the USS Worcester (CL-144) on October 13, 1950, bombarding North Korean coastline, Korea. 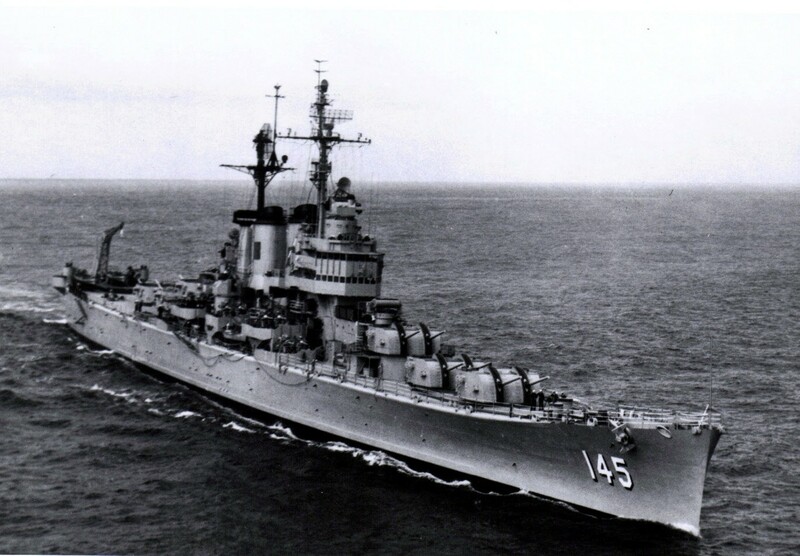 In the next video, you can watch the 3in/50 cal operation aboard USS Salem, a Des Moines class heavy cruiser, that used the same secondary guns of the Worcesters, as well as their Mk16 8-inch guns of similar design with the Worcesters' 6 inch gun but in contrast with the latter's gun, the guns of Des Moines cruisers proved very successful in the naval gunfire support to prolong their life (USS Newport News was decommissioned in 1975, 17 years later than the Worcesters!). The Worcesters epitomized the hard-hitting dual-purpose cruiser. 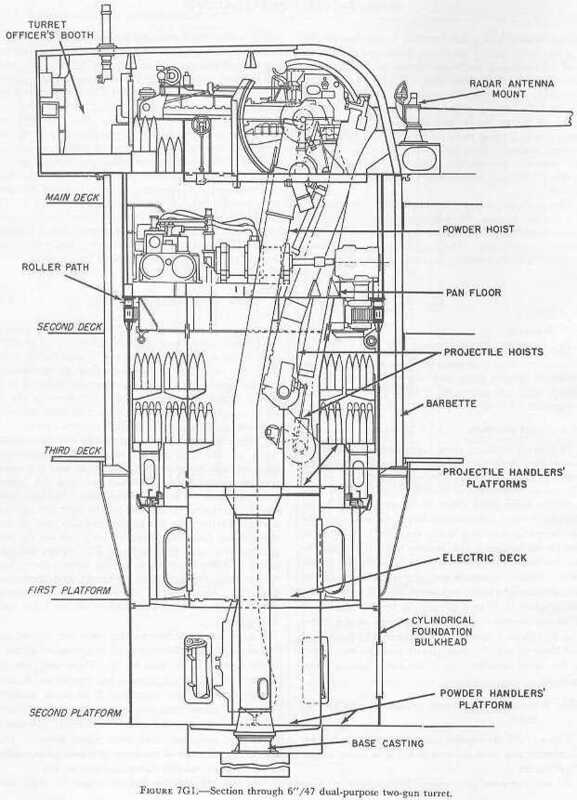 However the design is largely considered a failure, as the main armament of the so called "advanced" twin automatic 6-inch guns turned out to be unreliable since they never achieved fire rates of more 9-10 rpm (at best!) which was lower than the similar design of automatic 8-inch (203 mm) guns on the Des Moines class heavy cruisers. Αccording to NavWeaps "These guns did not prove reliable in service, possibly because of the high rate of fire and need for any-elevation loading. Another contributing cause was that they used a dual projectile hoist system - one for AP and one for HC/AA shells - which proved to be a source of jamming." 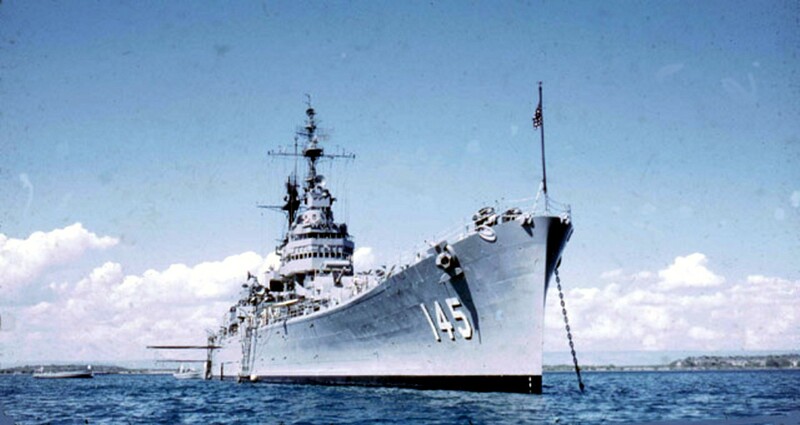 Port bow view of Worcester moored in Boston, MA, 1954. 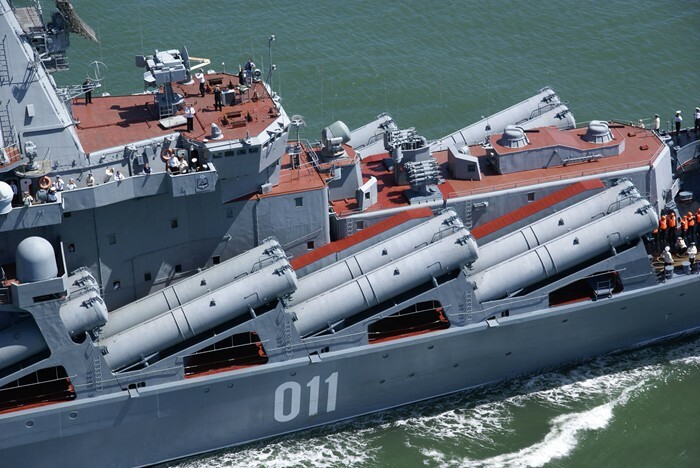 At the same time, the technological developments were significant (anti-aircraft missiles, aircrafts' speed and maneuverability etc.) consequently the ships of the class become obsolete very quickly. 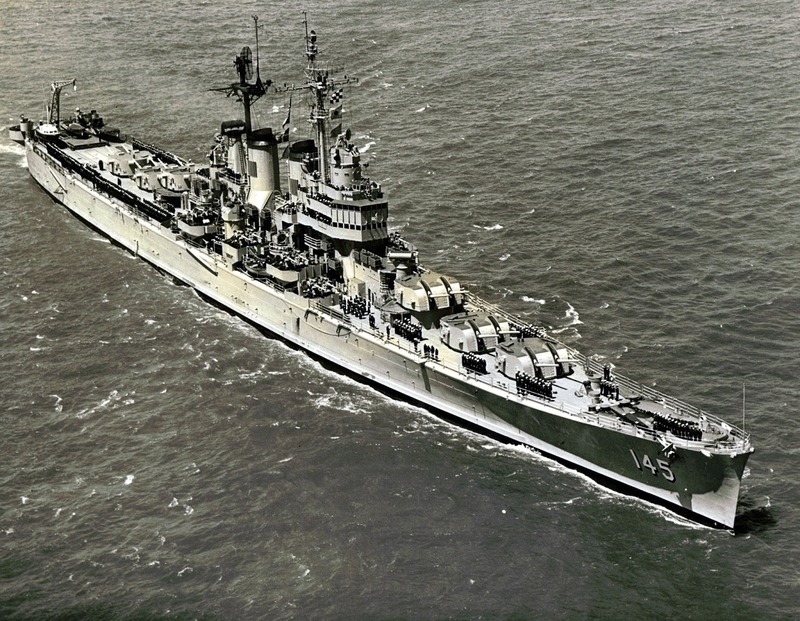 Also the fire control fitted to the Worcester was optimized for anti aircraft fire rather than surface action or gun fire support and the Royal Navy 6 inch gun cruisers HMS Belfast and HMS Jamaica actually performed much better in this role during the Korean War. 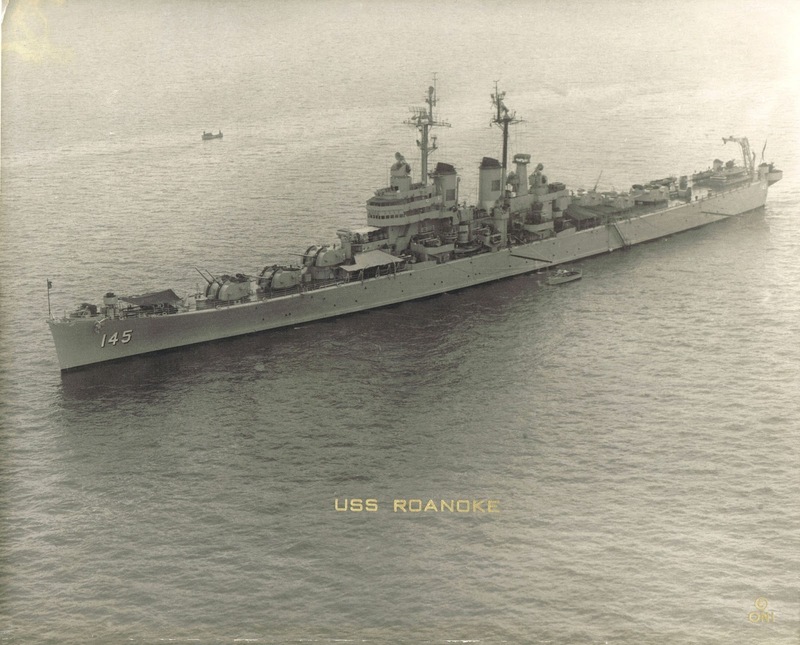 Worcester and Roanoke seemed to offer little more than the post- war group three Juneau-class light cruisers on 40% of the displacement, the USS Juneau (CL-119) as refitted in in 1951 with 6 twin Mk 38 5-inch (127 mm) guns and twelve (12) 50 3-inch (76 mm) guns on 6,000 ton displacement seeming a better answer. 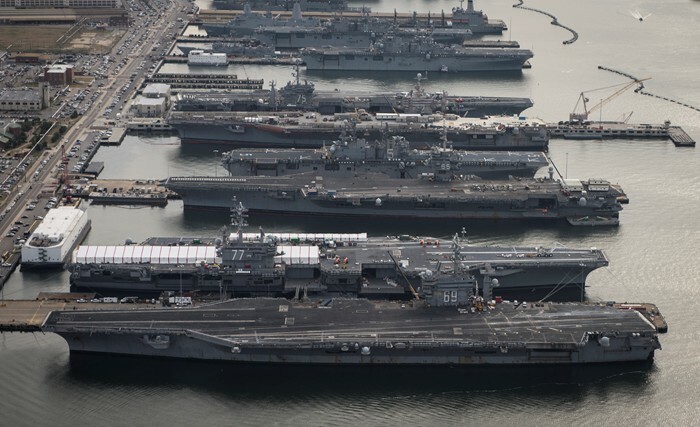 Moreover, the ships, had a maximum speed of 33knots speed, which means that they were no faster than the aircraft carriers they were designed to protect. The ship's complement was initially 1,070 men but actually the crew requirements in order to operate the ship was between 1,400-500 men! 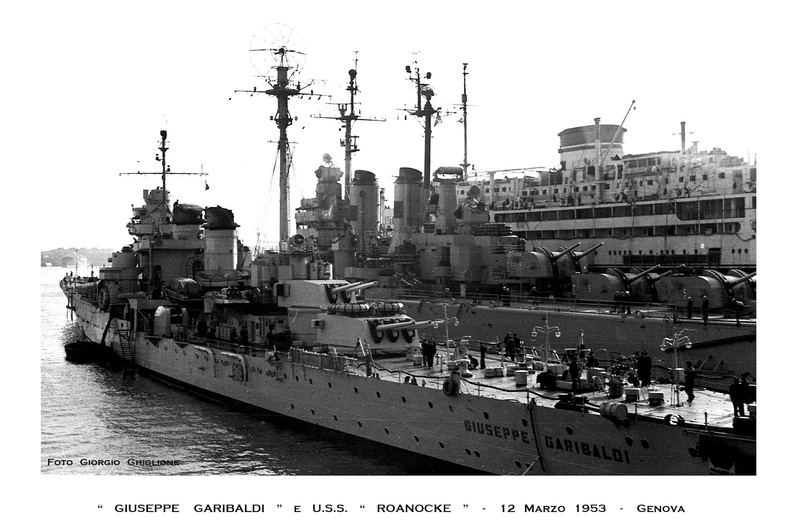 Both had very short service lives as they were placed in reserve the last months of the year 1958. 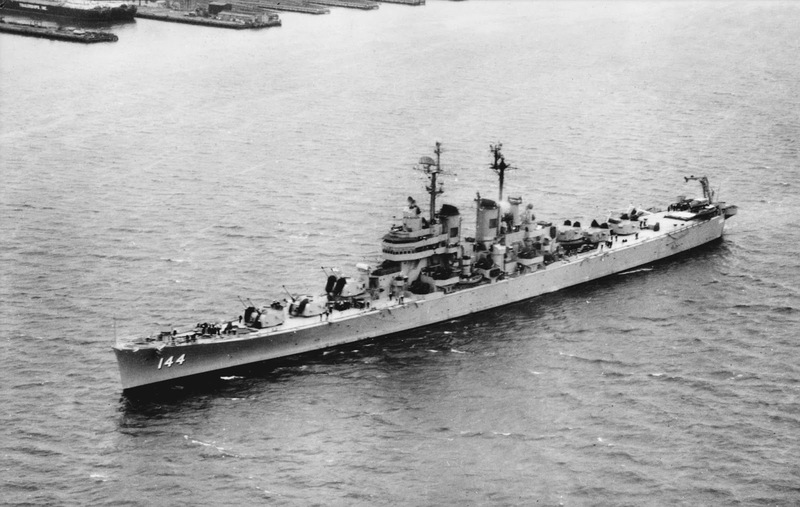 The revolutionary light cruisers, that never had a chance to prove themselves in their designed role, were subsequently sold for scrap in 1972-3. 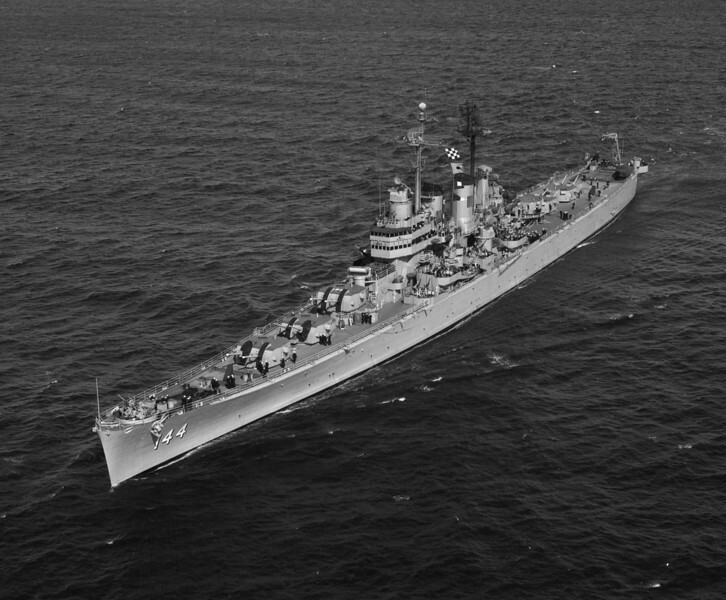 They were the last conventional light cruisers to serve in the United States Navy fleet and the largest US Navy light cruisers ever. Naval Firepower-Battlehsip Guns and Gunnery in the Dreadnought Era by Norman Friedman (2008). This is beyond doubt. 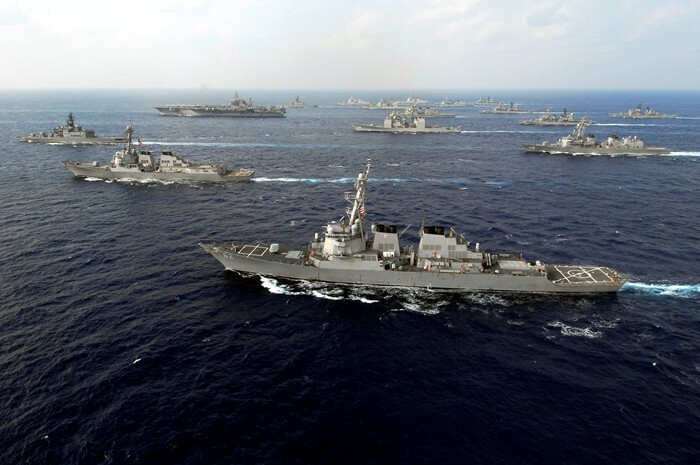 Turkey, with an impressive fleets, that gets stronger every year, of course is and will be an important player in the Mediterranean (with the acquisition of the aircraft carrier even more). 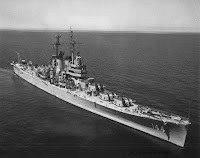 In terms of surface capability in size,speed and hull the USS Worchester was pretty similar to the Sverdlov and as equally heavily armoured, but by the mid 1950s it hardly seemed relevant as the 8 inch gunned Baltimores and the US Carrier fleet, appeared a much more effective answer to the Soviet surface fleet of the time. 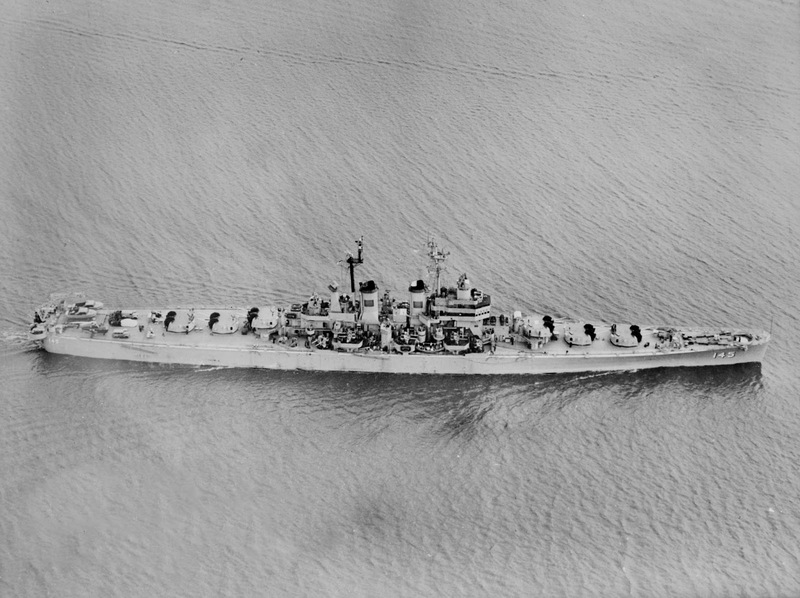 World War Two had pretty convincingly proved that suposed superiority of the faster fl;ing 6 inch gunned cruiser over the larger 8 inch cruisers which led the UK ot concentrate on 6 inch cruisers for trade protection and fleet use and for the Kreigsmarie to almost lay down the Lutzow and Seydlitz as type B 18,000 cruisers with four triple 6 inch turrets in 1936 until the political reality of the new Soviet 7 inch gunned Kirov cruisers threatened in the Baltic. 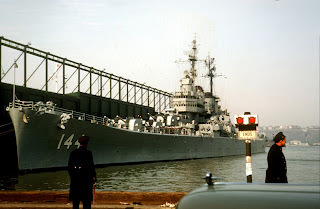 Pre and Post war the six inch gunned cruisers seemed less offensive from a political and damage limitation cold war limited actio perspective. but in actual ship fighting in the River Plate and the Battle of Denamark Straight and North Cape, the RN HMS Exeter and County cruiser had shown they could inflict critical damage on capital ships were the 6 inch cruiser really couldnt. 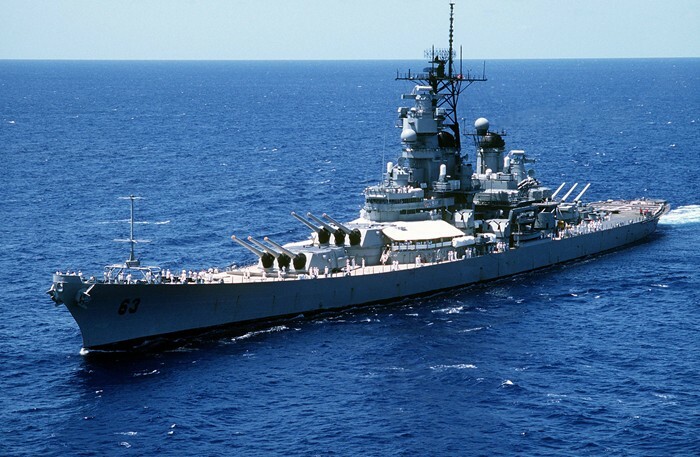 More speed, size and armour might give equality, it did not give superiority and in period from 1960-1972 the USN was the one Navy prepared to exploit the heavier 8 inch fire support of the Baltimore class and USS Newport News 8 inch guns. A slight futhur ,increase in gun size to the 9.2 inch guns for the, stillborn Admiral class or the never built 8.7 inch gun Soviet Battleships which Stalin abandoned for his never finished Stalingrad class, seemedd likely to finally maximise bombardment and remaining surface fightig power. 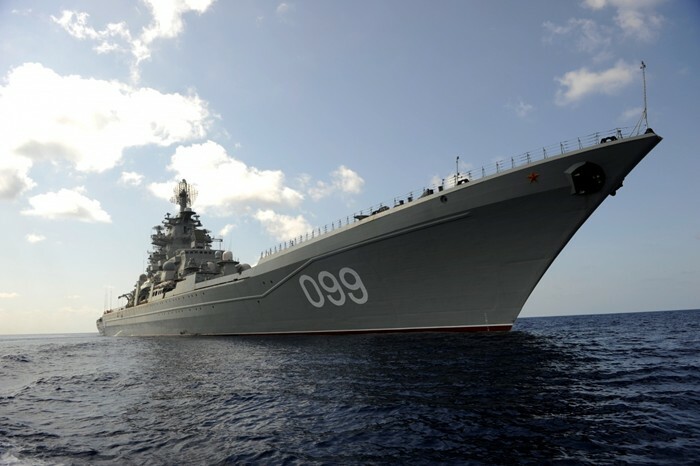 This was Stalin's answer to the precieved speed and bombardment capabilities of the USN 12 inch gunned Alaska class, Large cruiser. 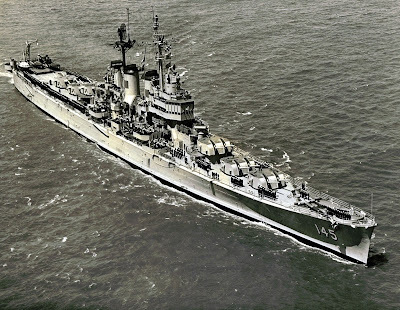 The Worchester class proved useful for a decade as new large command and aircraft direction ships rather like the final Oregon City cruiser, USS Northampton fitted out as a command ship.